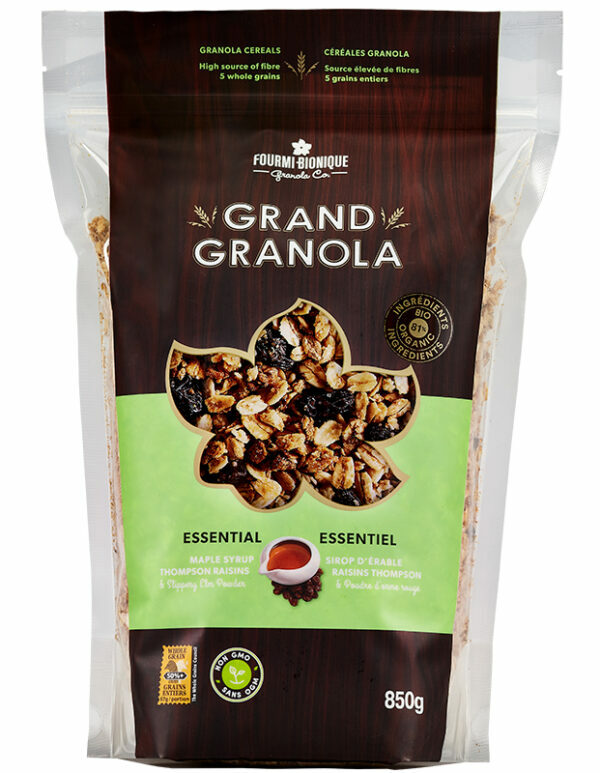 A tribute to Quebec, the Grand Granola Essential is a creamy blend of granola with comforting sweetness, combining the aromas of maple syrup with the velvety texture of organic red elm… Relaxing and soothing. 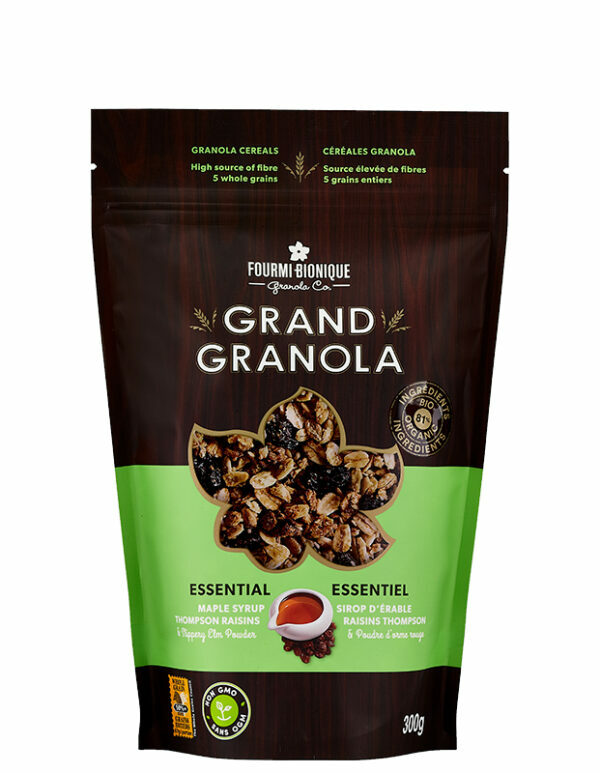 This blend of Quebec sourced organic cereals, paired with the delicately sweet scent of maple, goes perfectly with milk at breakfast or brings a touch of crispness to your fruit-based desserts. Get new ideas and inspiration with our simple and original recipes. This product is certified by Ecocert Canada for its organic ingredients, Kosher Parve by COR, and Whole Grains by the Whole Grain Council. This flavor is also offered in an economic and recyclable bulk packaging. Rolled oats*°, Sugars (maple syrup°, cane sugar*), Whole spelt flour*°, Sunflower oil and/or Canola oil, Thompson raisins* (raisins*, vegetable oil*), Rolled rye*°, Rolled barley*°, Oat bran*°, Coconut*, Natural flavour, Flax seeds*, Sesame seeds*, Slippery elm powder*. May contain almonds, cashews, macadamia nuts, hazelnuts, pecans, milk, soy, wheat and ingredients made in a facility that processes peanuts.